On 27th December 1851, a report in the Illustrated London News, headed “Private Theatricals”, stated that “on the 18th inst.” Sir Percy and Lady Shelley had “…opened their pretty little private theatre, at Boscombe…” to the surrounding nobility and gentry. The evening’s entertainment, at what is now called The Shelley Theatre , included The Gentleman over the Way, “a translation from the French, by Percy Shelley” and an “extravaganza” called Candaules, King of the Sardes, co-written by Sir Percy and Hon. Grantley Berkeley. All of the “scenery, machinery and decorations” had been “painted and arranged” by Sir Percy. The London Evening Standard reported on 5th February 1856 that, during the previous week, the vicinity of Christchurch had been “enlivened by a series of theatrical performances”, both at the home of Colonel and Mrs Waugh on “Branksea Island” and also at “Boscombe House“, the mansion of Sir Percy and Lady Shelley. One of the plays performed at Boscombe, The Wreck Ashore, was said to be a “serious business for any private company to attempt”. The latest extravaganza by Sir Percy, entitled A Comedy of Terrors, was “much in the usual fashion – all scenery, traps, changes and dress, not much to act, but a good deal to look at…” The theatre itself was described as “the most complete thing of the sort attached to any of the residences of the nobility and gentry in the kingdom”. It had a green room and dressing room and was “beautifully lighted with gas”. After each evenings’ entertainment, members of the audience were treated to a “splendid supper” at the mansion. In the spring of 1867, “amateur theatricals” were being performed on Tuesday and Wednesday evenings “with much success”. It was noted that Sir Percy had composed most of the music for the productions. Many of the performances were given in aid of charity: in January and February 1872, money was raised for the building fund of the National Sanitorium, Bournemouth. Sir Percy started building another theatre in 1879, close to his town house in Chelsea and opposite the studio of the artist, James Whistler. According to the Durham County Advertiser, the stage at Chelsea was going to be “fitted up with all those improved mechanical appliances so conspicuous at Boscombe”. Also, as at Boscombe, the Chelsea theatre was intended to be devoted chiefly to amateur and charitable performances. At the end of January 1885, Sir Percy Shelley once again re-opened his private theatre, for a season of four nights. And again, much was made of the “scenery, machinery and mechanical effects”. The play itself, Mr Herbert Gardner‘s “excellent comedy”, Time Will Tell was given an enthusiastic write-up in The Illustrated Sporting and Dramatic News. The stage management and “the finish of the performance” were highly praised. The troupe were favourably compared with the renowned amateur dramatic group: The Old Stagers and The Windsor Strollers. Mention was also made of Gardner’s earlier, much celebrated play, Our Bitterest Foe, which had been premiered previously at Boscombe and had gone on to enjoy “three distinct runs” on the London stage. 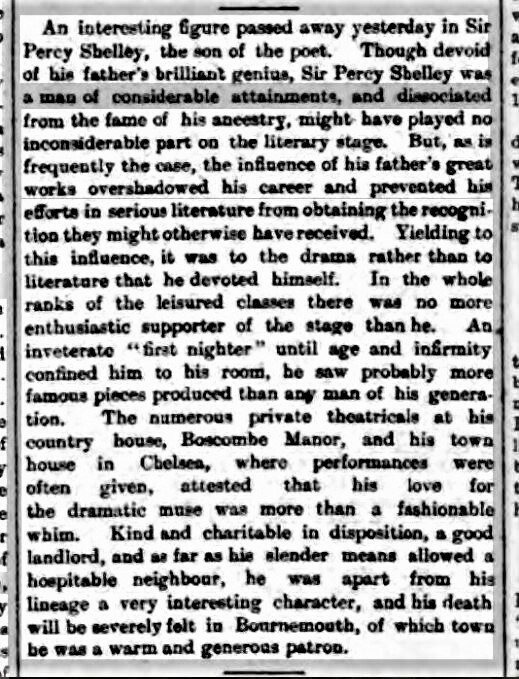 In an obituary to Sir Percy Shelley, after his death on November 5th 1889, the Yorkshire Post said that “in the whole ranks of the leisured classes there was no more enthusiastic supporter of the stage than he”. Go along to The Shelley Theatre to see what’s happening right now at this wonderful historic theatre.